The business of politics and the politics of business: both are dangerous combinations which can potentially destroy the economy of a country, and plunge in to darkness. Law enforcing agencies should ensure that both business and politics remain separated so that both can function without any corruption. But sadly, this seems like a fiction story in India right now. It has been confirmed that Indian corporate sector does not want to reveal its political donations. As the rules and regulations of new Companies Act 2013 are being formed right now, CII or Confederation of Indian Industry has written to Ministry of Corporate Affairs to amend a particular clause which will help them to keep this information as secret. Confederation of Indian Industry (CII) is a very powerful lobby of Indian corporate sector, with 7000 direct members and more than 90,000 indirect members from all over India. And when CII makes a request to the government, it is bound to get noticed. Chandrajit Bannerjee, director general of CII has confirmed that such a request has been made to Ministry of External Affairs. If this clause is properly enforced, then we can image a tsunami of secrets tumbling out after the elections. The political party which will lose will make sure that all the dirty secrets and under the table donations of big corporations come out in public. Previously, Companies Act only asked the companies to name the individual for which the donation has been made. But the new Act directly asks the name of the political party, which is the bone of contention for the corporate sector. Last year, Association of Democratic Reforms (ADR) and National Election Watch had done an analysis on the donations received by 6 major political parties: Congress (I), BJP, BSP, NCP, CPI and CPI (M) between 2004-05 to 2011-12 and some very interesting figures came out. Majority of political donations are originating from ‘unknown’ sources. ‘Known’ sources contributed more than Rs 4000 crore to these 6 political parties between this period. 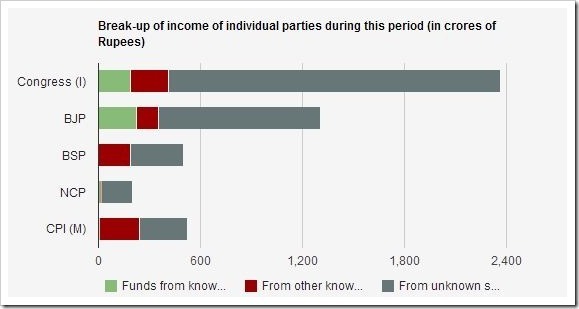 These known sources were scooped out from Income Tax returns of these political parties. Congress was the greatest beneficiary of unknown political donations: Rs 2008 crore in this period. Out of top 50 Indian companies, 26 companies had donated to political parties. These companies include: Jindal group of industries, Adani Group of Industries, Shyam group of industries, Essar group of industries, ACC and Ambuja Cements, Vedanta group of industries, Torrent Power Ltd, Salgaoncar, Chowgule, etc. And if observed closely, then most of these companies are from the sectors of power generation, cement, steel, sponge iron and export of iron ore; all of which are marred in scams and controversies. Do you want the new Companies Act 2013 to include this clause which mandates all companies to reveal their political donations? Or you wish that such anonymous and unknown funding keeps on piling up? Do share your comments right here – It is your country and your people involved here. CraftsVilla.com Becomes One Of The First Indian Ecommerce Companies To Turn Profitable!